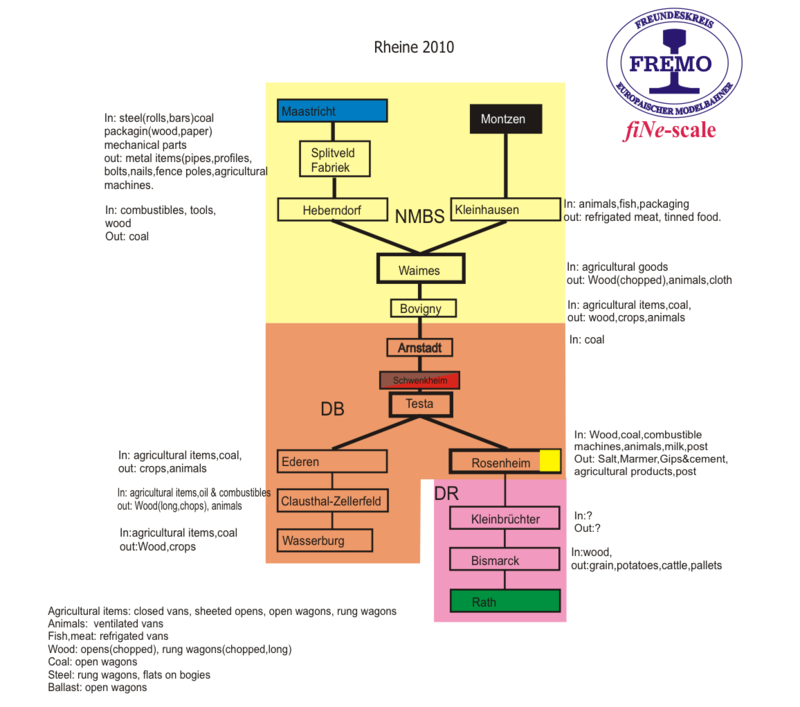 This page will give the state of the art for the planning of the fiNe-scale layout to be built for the meeting in Rheine. 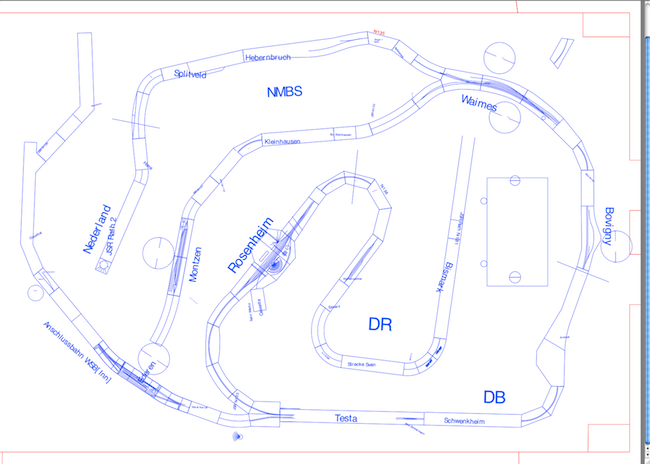 The planning is the aula on the groundfloor of the Kopernikus Gymnasium in Rheine. This is the drawing used for the planning. please click on drawing for download. Next figure shows the system that is built. There are several countries which have border traffic seperating the timetables. This one is a rather complex layout with four timetables which do all interconnect. In the sketch we see the different areas. The yellow piece is Belgium. Waimes is the traffic center with many short goods to and from Heberndorf, Bovigny and heavier trains to Montzen, Splitveld and Maastricht. Passenger traffic is between Maastricht and Montzen via Waimes. The orange part is german DB region. Between Belgium and Germany are only a few international trains. Several Dg's to exchange the main goods traffic and an international passenger train that connect Maastricht and Montzen with Testa,Rosenheim and Rath. From Testa is another branch to Wasserburg, this branch is more or less independent. On this branch Clausthal-Zellerfeld is the main station that dispends some smaller goods trains between Wasserburg and the E-werk power station. The pink section is eastern Germany. The section between Schwenkheim and Rath is very long, therefor Rosenheim serves as borderstation which manages the goods trains between Schwenkheim and Rath to both sides. Passenger traffic is between Testa and Rath for this section. The planning is for a short half day sections between 8-20 hr which take slightly over 2.5 hour each in time. In case of manpower shortage we can drop some trains (Ma,Wo,Fr) and some Pt's as well. The additonal planning per train will be added later. Below are the time tables as pdf for download.